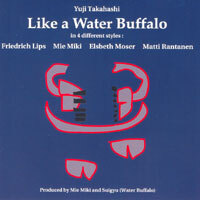 Famous accordion performers Friedrich Lips, Mie Miki, Elsbeth Moser, Matti Rantanen are the artists on this CD. Water Buffalo is a friend of peasants in Southeast Asia for centuries, although in these days they are being replaced by the tractors "the iron water buffalo". We took the name for our band we formed to introduce Thai protest songs in 1970s against military dictatorship. Australian poet and activist Wendy Poussard visited our home one day and wrote the poem for the band, to which I then composed a melody. This melody and the accompaniment inspired by the sound of the wooden cowbells which water buffalos have hanging from their neck, are turned into a piece for accordion solo, which Mie Miki asked me to write music from my heart for her instrument. That was in 1985 and I asked her to give the music to anyone who wanted to see the score. As a song reachs the ears behind the prison walls, and is handed down from musician to musician, we hope this music will strongly transmit the sound of freedom.